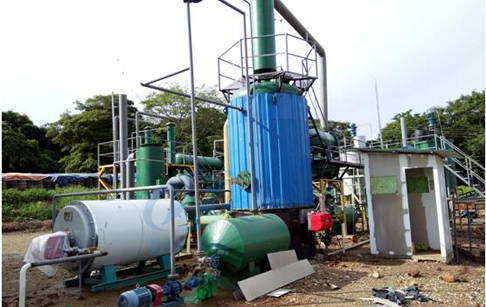 Waste oil distillation process plant is self-shunt vacuum distillation unit, distillation system uses a tube furnace (independent research) heating the continuous distillation process under negative pressure to be waste oil distillation.Because the waste oil contains large amounts of water so we should dehydration before distillation.For example, the raw material ( like used engine oil) recovery is more than 90% when the water percentage is less than 5%. 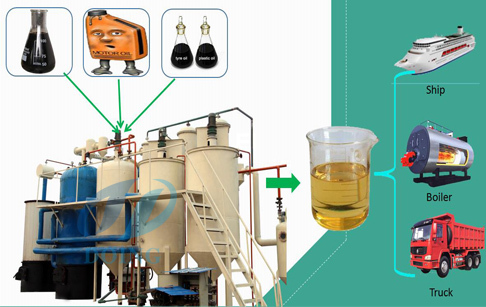 In the process of waste oil distillation process plant,The cold materials (waste oil) should be pre-heat exchanger with the overhead vapor phase component first.Materials after heat exchange into the falling film evaporator using secondary heating flue gas dehydration,and then through the tube furnace heating again after after the temperature meet the process requirements into ectification within the column Control reflux ratio at the same time, On the top of the gas phase components after heat exchange with the raw condensation receiving tank into the light components, To restructuring after restructuring of condensing tank,Tank bottom components into the slag,Non-condensable gas back into the tube furnace combustion after water seal. 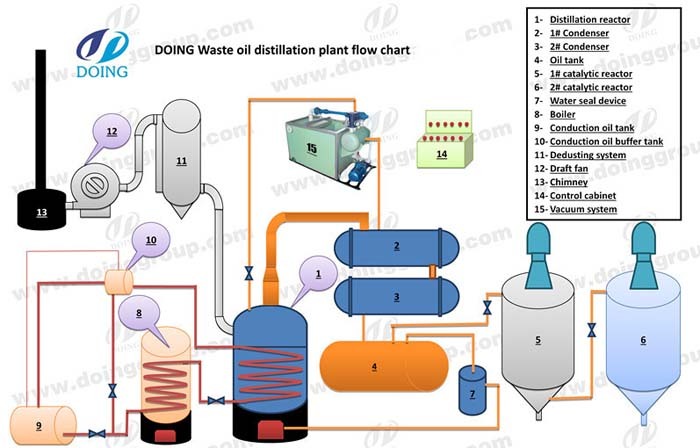 If you wanna to get more details about Waste oil distillation process plant you can send E-mail to market@doinggroup.com. You can consult our professional engineer and specialized sales team with leave a message in below form.We will contact with you ASAP.You also can visit our factory in Henan,China.Get Detailed address.